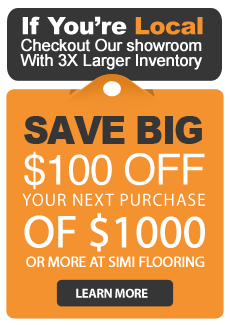 Flooring 101 Simi Valley : Will Climate Affect my Floor ? One of the biggest factors to consider when choosing a flooring material is how it will handle the climate where you live, because while some floors will handle almost anything others can easily be destroyed in the wrong conditions. Here is a brief look at how climate impacts some common types of flooring. Being a natural material, hardwood can be vulnerable to the elements. It is best suited to moderate climates that have very little variation in heat or humidity as moisture can lead to boards expanding or shrinking. Extended periods of direct sunlight can also cause hardwood to fade. Carpet is a great choice for almost any climate as its impressive insulating abilities mean it can easily deal with heat as well as cold. The one climate carpet isn’t suited for is high humidity, because moisture in carpet can lead to mold and mildew. Carpets are also extremely difficult to dry and tend to shrink as they do so. There isn’t much that a professionally tiled ceramic floor can’t handle. Ceramic tiles can easily withstand hot and cold temperatures alike and providing it has been sealed properly, moisture won’t do any damage either. The only climate related issue that can negatively impact ceramic tiles is that they will become slippery when wet. This extremely popular type of flooring can handle almost anything, but prolonged exposure to direct sunlight will cause the vinyl to fade over time. Vinyl flooring will also get slippery in wet conditions. High pressure laminate can deal with all manner of temperatures and levels of humidity without being negatively affected. Weaker laminates, on the other hand, are vulnerable to changes in heat and humidity, often swelling or contracting as a result. A well laid concrete floor can handle anything from heat and moisture through to freezing cold and will outlast almost any other type of flooring. The only climate related danger for concrete is that is can become slippery in wet conditions. Providing that your linoleum flooring has been professionally installed it will thrive in almost any climate. The only place linoleum flooring is not recommended is in below­ground basements, especially in wet climates, as moisture from underneath a linoleum floor can cause staining. Extended exposure to direct sunlight can also cause linoleum to fade. Like hardwood, cork is vulnerable to heat and humidity which can cause it to expand or contract. While cork flooring that has been properly acclimatized and professionally installed is designed to resist moisture, it is not recommended for use in climates with high humidity. flooring to fade or discolor. Not all floors were made equal, so for your new floor to be at its best it needs to be designed to suit the climate where you live. While moisture barriers and professional installation will all make a huge difference to flooring performance, for best results, choose a flooring type designed to handle your local climate.